As you may know, we are gearing up for our last Arts & Crafts Festival of the year. 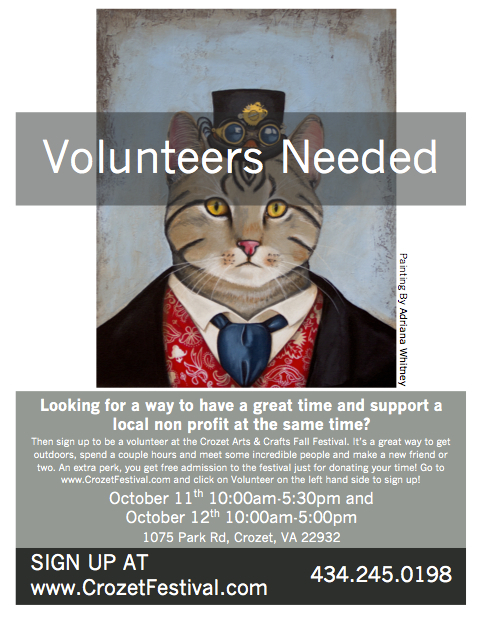 This is the Crozet Park’s largest fundraiser and we are expecting a great event with large crowds. To be successful, this event requires many volunteers and I’m hopeful, many of you will consider volunteering. Those who volunteer are given free admission to the event. A list of volunteer opportunities can be found at: http://crozetfestival.com/ . Please consider signing up for one or several activities.